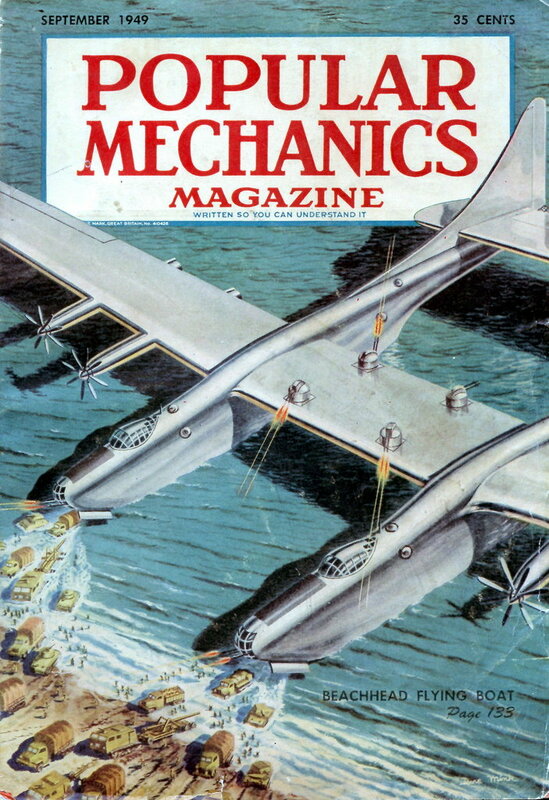 WHEN THE mad scientist in the movies pulls the switch and his fantastic machinery begins to hum and glow, causing flashes of man-made lightning to leap and crackle around the room, you can be fairly certain that Kenneth Strickfaden is somewhere in the picture. Ever since he created the electrical effects for “Frankenstein,” Strickfaden’s genius has been in great demand among motion-picture producers when spectacular laboratory trickery can be made to fit into the plot. Strickfaden not only created the effects for “Frankenstein,” but also doubled for Boris Karloff in sequences which called for million-volt sparks playing over his body. Since then, he has added his wizardry to “Son of Frankenstein,” “Bride of Frankenstein,” and the other sequels; the “Buck Rogers,” “Flash Gordon,” “Sherlock Holmes,” “Chandu,” and “Fu Manchu” featuresâ€”altogether more than 50 movies in the last 15 years. Although the movie producers insist that Strickfaden is the only man to be trusted with such high-voltage trickery, he says frankly that there are no mysterious secrets to what he does. It’s a matter of combining well-known principles of electricity with principles of showmanship. He has designed machines for producing and controlling extremely high voltage, extremely high amperage and high-frequency electrical currents. He builds all the machinery in his home workshop. Merely producing the high voltage or high amperage is fairly simple. Any clever student of high-school science might be able to do it, but keeping the currents under control calls for more knowledge. His own apparatus is relatively safe, but Strickfaden warns that high voltage not kept in proper balance can be dangerous. One of the key pieces of equipment which Strickfaden uses is his million-volt generator. This device produces the biggest sparks, fat, blue flames which stab six feet into the air, and is the most complicated in design of his inventions. This generator operates from regular alternating current of 110 volts. As the first stage in the boost to a million volts, the current passes through a transformer which raises it to 20,000 volts. It then enters his multistributor device, a rotary switch which allows a loaded condenser to discharge into the primary circuit of the million-volt resonator. The multistributor consists of a motor-driven, whirling electrode with five points. At great speed these points pass another electrode with a set of seven points. As each point of one electrode passes a point of the other, a 20,000-volt spark occurs. These sparks form featherlike flashes between the two rings. The inner electrode spins at a speed of about 1000 revolutions per minute. The make-and-break effect of these sparking electrodes charges and discharges the high-capacity condenser into the 10-turn primary of the resonator, which has a secondary winding of 1000 turns. Sparks which leap from the resonator, although they will cross a six-foot air gap, have enough amperage to cause acute discomfort, but could not be considered dangerous, Strickfaden says. A shock from the multistributor part of the circuit, however, would certainly be fatal. When this huge generator discharges for only a few seconds, the air becomes acrid with the smell of ozone. Radio and television reception is disrupted for blocks. Actually, the generator is something of a radio station, broadcasting on a frequency of 40 kilocycles. It could be used as a receiving set, if some station were broadcasting on that frequency. 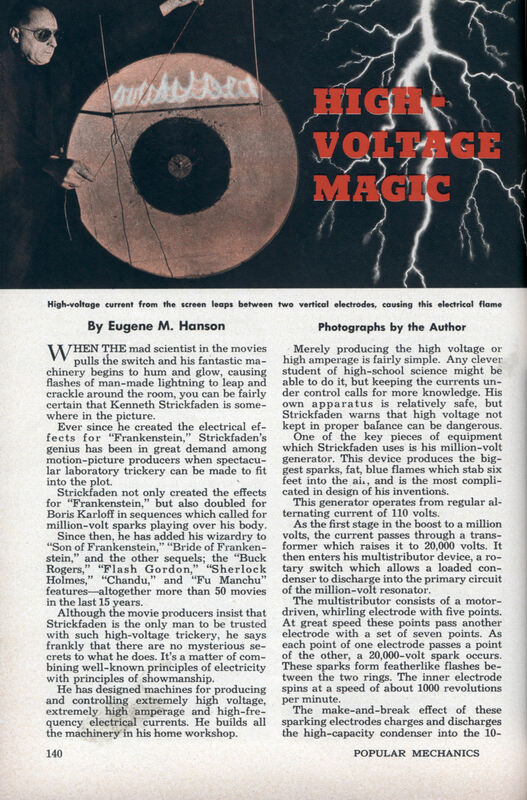 Another device which employs high voltage and which Strickfaden uses for some of his spectacles is called a “lightning screen.” This is a high-voltage generator which discharges its sparks across a disk with a radioactive backing. When used on a darkened stage, the radioactive material continues to glow along the path of each spark after the current is turned off. Current from the same device produces an electrical flame when the current is brought away from the screen to a pair of electrodes. The only connector between the two electrodes is a moistened stick of wood, to provide a path for the spark, which climbs to the top of the upright electrodes. Extremely high amperage produces sparks in a “pyro-geyser” display that results from the use of a transformer. This particular transformer is somewhat unusual in that there is only one turn in the secondary coil. When the contact is made between the two iron points of the pyro-geyser, as much as 10,000 amperes of current can flow, with the resulting flash of vaporizing metal as heat is generated. This device is similar to an arc-welding machine, except that it employs a much heavier current than the amount consumed by either an a.c. or d.c. welding outfit. The nature of the sparks thrown out by the pyro-geyser varies with the type of alloy used in the electrodes. Besides staging electrical phenomena for the movies, Strickfaden designs and builds weird-looking scientific props, such as a Buck Rogers gun for use in the imaginative and futuristic films. More important to him now than his movie work is his educational career. He presents spectacular science shows for high-school programs throughout the country, explaining each trick in terms linked to the students’ own study of physics. Often, he is called back to repeat his programs, and on those occasions he is pleased when the students can show him small replicas which they have built of his startling machines. For the school programs, Strickfaden also creates music with electrical instruments of his own design, he demonstrates brilliant lighting effects with ultraviolet light on radioactive materials, baffles the students with his “gravity neutralizer” and broadcasts with a tiny radio station powered by a flashlight battery. He is planning even more elaborate musical instruments and still more spectacular high-voltage equipment. Most of his spare time now is spent in his home workshop, preparing the various parts which will be used in his coming creations. Also for “The Munsters” and “Young Frankenstein”. Yes, there still are mad scientists. Or Google coin shrinking and can crushing.